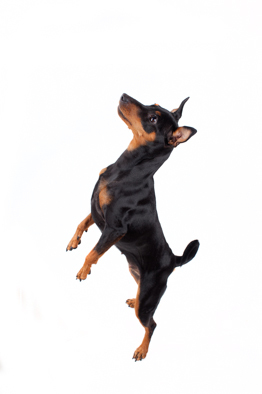 Nemi is a black/tan miniature pinscher female. She is born 27.02.12 at kennel Warscot’s and we brought her home to us May 5th 2012. When we first got her,she was a tiny girl, but now as an adult she is 27cm high and around 4,5 kiloes. She has not attended many shows, but the at the ones we have been to, her critiques has been very positive. Nemi is a fantastic and cuddly girl, she is very loyal and attached to her family. She comes with us almost everywhere, even on sailingtrips and holiday to Spain. Nemi loves walks, but not in the rain. According to her, rainy days should be spent under a blanket on the sofa. It is impossible to be bored when Nemi is around, she does the weirdest and funniest things! She is a good guard dog, except she does not scare anyone. Nemi is an active, healthy and happy dog, and she is a god representative for her breed both when it comes to behaviour and exterior.